Located between Millau and Montpellier in the Hérault, le Pas de l’escalette is the old pilgrimage moutain pass linking the Larzac plateau and the Mediterranean. Nestled at 350 meters (1200 feet) at the base of the Larzac plateau, our estate of about twenty hectares is spread over some fifty terraces on either side of the valley of Pégairolles de l’escalette and Lauroux. The vineyard are enclosed by ancient rock walls and large stone piles –known locally as “clapas”. High above and to the north, the Larzac plateau’s steep flanks provide a protection from elements and natural irrigation from its springs. In this way, the land’s biodiversity and our respectful ploughing of soils produce grapes in total harmony with their environment. The estate is certified in organic farming and is in the process of obtaining the Biodyvin biodynamic label. 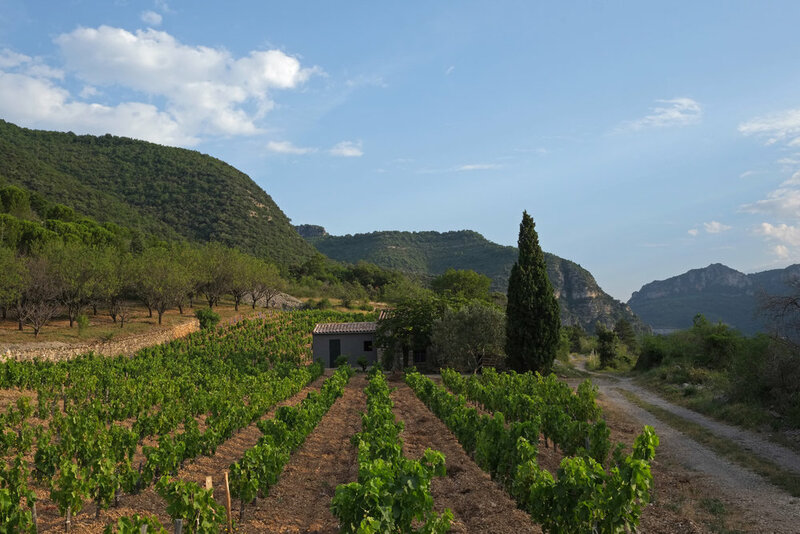 The altitude, the deep and draining clay-limestone soils, the fresh climate of these valleys; all conditions are met to produce wines of freshness and fruity tension very specific to this terroir. We work exclusively with the southern varietals: grenache and carignan for the majority of our blends, syrah and cinsault. For the whites, the old vines of white carignan and terret bourret are associated with white and gray grenache. "Two stubborn forces, two powerful wills: in this sumptuous and rough country, they were convinced that something beautiful could be done."